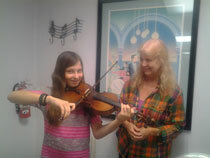 Greetings from The Music Den, home of quality Orlando guitar lessons, piano lessons and more. Half-hour private lessons at the studio are $22 each. Group lessons are $11 each for a half-hour, once-a-week group class. In-home lessons are $44/hour. You must be registered and pre-pay for the entire month to receive the normal rate. Single lessons may be purchased for $30 per half-hour in-store or $60 per hour in-home. No registration fee is required when purchasing single lessons. Discounts are available for multiple-student families, multiple attendances per week and bulk purchases of 3 months or more. WE ARE CURRENTLY OFFERING FREE TRIAL PRIVATE LESSONS! Tuition is collected for the month in advance on the last week of the previous month. REMEMBER YOU MUST BE PRE-PAID BY AT LEAST ONE WEEK IN ADVANCE TO RESERVE A LESSON TIMESLOT! There is a low one-time $35 registration fee. Gift certificates are available upon request. You can pay below with a credit or debit card by selecting the desired item(s) and clicking the ADD TO CART button. Clicking this button will take you to PayPal's payment center where you can select the number and type of items you wish to pay for. Group and in-home lessons can be paid for by paying for an equivalent dollar amount of private lessons. Thank you in advance!